Estimating the economic impact of seasonal employment can be tricky. But there's a lot to learn from how the tourism industry does it. 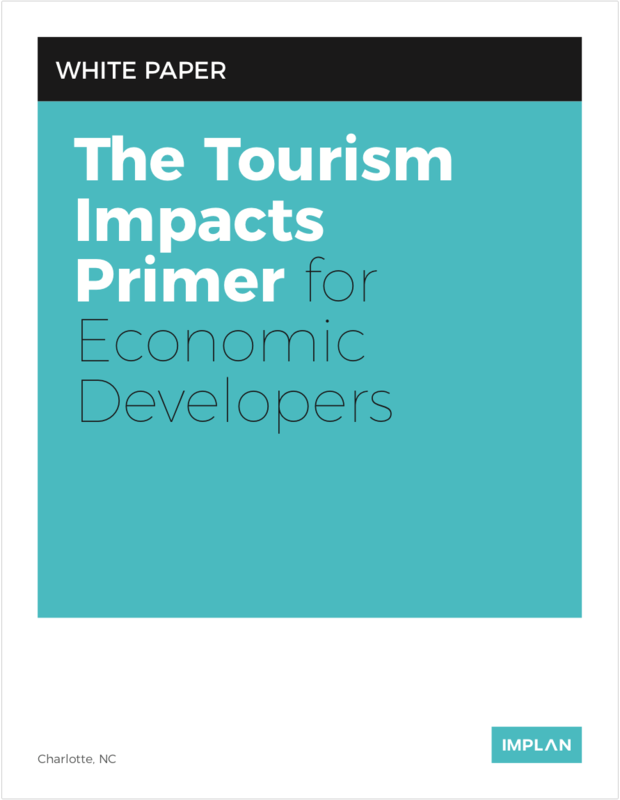 Check out “The Tourism Impacts Primer for Economic Developers” to find out how to translate job-counting methodologies to your own or any other industry. First, in IMPLAN, jobs can’t be assumed to be full-time. There are several definitions of “full-time” by various job-focused agencies, but IMPLAN counts the number of positions within a business. A single person could have two jobs and they’d be counted twice in the results. For wage and salary data sources, a worker is counted as a decimal for the amount of the year labor was conducted. When there is a worker that worked for half of a year, they’re recorded as .5. So if someone only works every summer, they’re counted as .25. It is important to keep in mind that whether someone works 10 hours a week or 40 hours a week doesn’t enter into the IMPLAN jobs calculation. The sources from which IMPLAN estimates jobs collect those numbers as though a head count was done about once a quarter in every business (where the number of workers in the office are counted four times a year and are then divided by four to get the annual average workers). This is somewhat different from how we might think of our own jobs where we interview for a position, get hired, and then work for several years at that same job. Every year that an available position in a company is filled by a worker equates to one job annually in IMPLAN. In other words, if a worker holds one position in a company for three years, then IMPLAN counts that as three jobs over the course of a 3-year impact analysis (we’ll explore this more in the multi-year impacts part). The simple definition above for a job works very tidily for economic impact analyses being calculated on an annual basis. However, when modeling the impact of a temporary activity such as a major sporting event (which may not occur in the same geography every year) then it’s worthwhile to interpret such jobs impacts more judiciously. For the NFL’s Super Bowl (for example), if there are 500 “new” jobs created to support the event, some of those jobs are not going to be genuinely new. A portion of the 500 jobs may in fact be jobs that existed prior to the event, but have now been expanded in scope to ensure the execution of the event. In this case, taking a look at employee compensation (EC) rather than total employment impacts may present a more accurate estimation. EC is perhaps more relatable or interpretable since it is an estimation of what workers are collectively paid for the entire year (especially when you know how much a particular job would pay per worker). Focusing on EC rather than total employment draws more attention to wages than the vagaries of accurately counting fractions of jobs for a short-term impact. It is very easy to overestimate job impacts for events which are measured over the course of several years. Consider the construction of a stadium which is expected to be completed after five years. When examining the results of the economic impact analysis of the activities associated with the project, the employment results can’t be taken at face value. This is primarily because a worker—we’ll call him Bob—hired by a construction company for example, is likely to occupy the same job over the course of the project duration. So where IMPLAN counts Bob’s job once per year for a total of five ‘jobs’ in the impact results, Bob personally held only one job the whole time. Bob’s job would be counted in the direct impact for each year and can be deflated by a factor of 5 to be reported as one worker rather than as five jobs—which is generally what people are assuming when they are interpreting results. While this isn’t a proper assumption, this is part of the concern of conducting a study beyond a five year window. As was the case with short-term impacts above, if you’d rather not try to explain the economic significance of Bob keeping his job for the duration of the project, then focusing on EC as the primary indicator of an economic impact works very well. This approach side-steps the issue of identifying whether or not Bob kept his job for the entire project, because the job’s annual wages are paid regardless of who worked for the entirety or a fraction of the construction timeline. Alternatively, the face-value employment impacts can be communicated as “job-years” which are used by many economic impact reporting methodologies. Revisiting our construction example, if the construction company employed 100 people to do the work over the five years, then the total direct employment impact would equate to 500 job-years. Generally speaking, the larger the study area in the analysis, the larger the job impacts are going to be. However, that isn’t always the case. Geography is an important variable. Thus, the aggregation of these factors is essentially why an impact analysis constrained to one geography will have a different employment impact compared to another similar geography. Aside from the factors above specific to the location of workers and businesses, IMPLAN accounts for regional idiosyncrasies that affect the compensation a worker would receive for a particular job in a particular part of the country. For example, a worker in the legal services industry in New York County, New York would likely receive a greater per annum than a similar worker in the same industry employed in Loving County, Texas. This difference is especially visible when comparing smaller geographies such as counties or metropolitan statistical areas for cities rather than larger study areas like states or multi-state regions. In cases where regional compensation for job types is not readily available, IMPLAN serves as a good resource for comparing or surveying regional employee compensation. When we think about employment outside of an impact analysis, we generally assume that all workers are individuals who would fill out a W-2. But there are other individuals who receive wages but fill out a 10-99 or some other tax form. That’s because proprietors are self-employed people or partners in firms. All of these different people with their unique tax forms are accounted for in the descriptive data for each industry within IMPLAN’s job impacts. The employment impacts listed are the sum of the wage and salaried employees and proprietors. One key differentiation between wage and salaried workers and proprietors is that proprietors can sometimes lose or make very little money in one year and make a lot of money in another year. This can have a skewing effect on the total employment compensation for an industry, sometimes making it appear as though workers are paid very little when proprietors made very little money in a year compared to their salaried counterparts. Income-to-job ratios are more variable than might be expected. Fortunately, IMPLAN provides the employment ratios for proprietors and wage and salary workers in order to accurately calculate the average annual compensation for proprietors as distinct to wage and salary workers. Lastly, another key consideration for proprietors is that they are counted as residence-based as opposed to business-location-based for other employee types. This means that when a business which primarily operates in one state has an owner or part-owner who resides in another state, IMPLAN records the employment compensation for the operations of the business as paid out to residents of both states. This is why some geographies may have an unexpected industry represented as operating within its borders (such as if a part-owner of an oil extraction company lives in Manhattan, for example). So the next time you're sipping your flat white, remember that jobs are a key number to focus on whenever deciphering the results of economic impacts and events. However, with these considerations and definitions in mind, you can properly interpret the impacts to effectively tell your story as well as be sure your own analyses conducted are top notch!